if a man is blameless, the husband of one wife, having faithful children not accused of dissipation or insubordination. For a bishop must be blameless, as a steward of God, not self-willed, not quick-tempered, not given to wine, not violent, not greedy for money, but hospitable, a lover of what is good, sober-minded, just, holy, self-controlled, holding fast the faithful word as he has been taught, that he may be able, by sound doctrine, both to exhort and convict those who contradict. 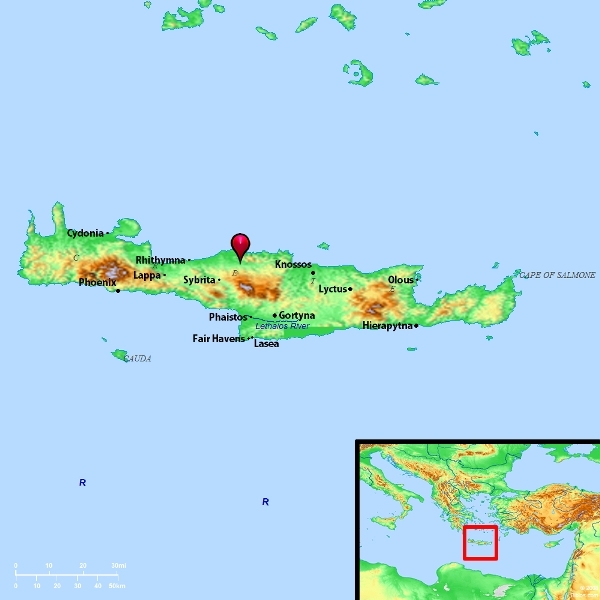 The island of Crete was not only populated, but highly developed, going back to the time of Abraham (ca. 2000 B.C.) and even beyond. In the years 68-66 BC, Crete was conquered by the Romans, and became a Roman province. Today it is one of the Greek islands. In our previous post we mentioned the archaeological excavations of Arthur Evans, which got underway in 1900. He is credited with inventing the term “Minoan,” naming the civilization after King Minos, who ruled the island of Crete, according to legend. Again, we rely on the evidence of frescoes and gems that show how the Minoans practiced an astonishing ritual that consisted of grasping a bull by its horns and leaping over its back. 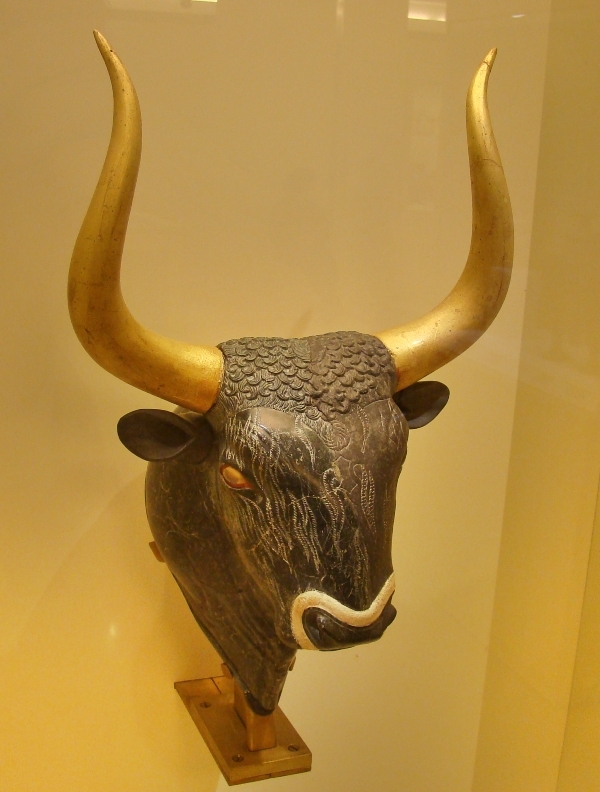 When we add this to the ubiquity of stylized bulls’ horns, so-called “horns of consecration,” as well as the bull’s head rhyta (drinking vessels; singular, rhyton) and vivid portraits of individual beasts, there can be no doubt that the Minoans treated the bull with deep reverence…The bull may well have represented the young male consort of the goddess of love, a pattern that recurs throughout the ancient near east from Tammuz and Ishtar to Venus and Adonis, although if this is the case we cannot even give names to the Cretan versions of the divine couple (pp. 49-59). 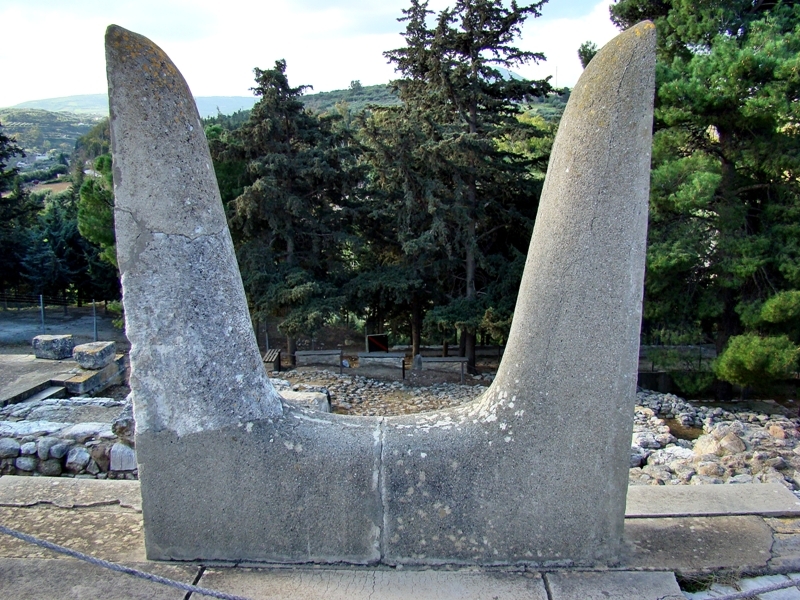 Bull's horns at Knossos, Crete. Photo ©Leon Mauldin. These restored horns symbolized the sacred bull. They once adorned the top of the palace at Knossos, Crete. The bull’s head rhyton (ceremonial drinking cup) in photo below is made of steatite (black metamorphic rock) and decorated rock crystal eyes and mother-of-pearl snout. Bull's Head Rhyton. Knossos, Crete. Photo ©Leon Mauldin. This libation vase is displayed in the Irakleio Archaeological Museum, which is said to house the world’s most important collection of Minoan artifacts. This artifact is dated at 1600-1500 B.C. This entry was posted on Friday, July 16th, 2010 at 9:41 AM and is filed under Archaeology, Bible History and Geography, Bible Study. You can follow any responses to this entry through the RSS 2.0 feed. You can leave a response, or trackback from your own site.